Who really enjoys a toasted, buttery, Hot Cross Bun, in the run up to Easter? 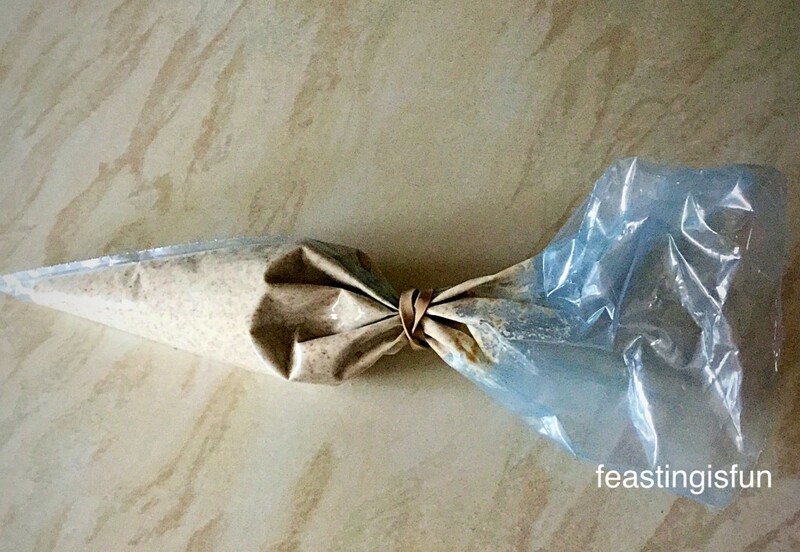 While my previous post shows you how to make the regular version I wanted to make a wholemeal version. Because some people, for various reasons, can only eat 100% wholemeal bread. 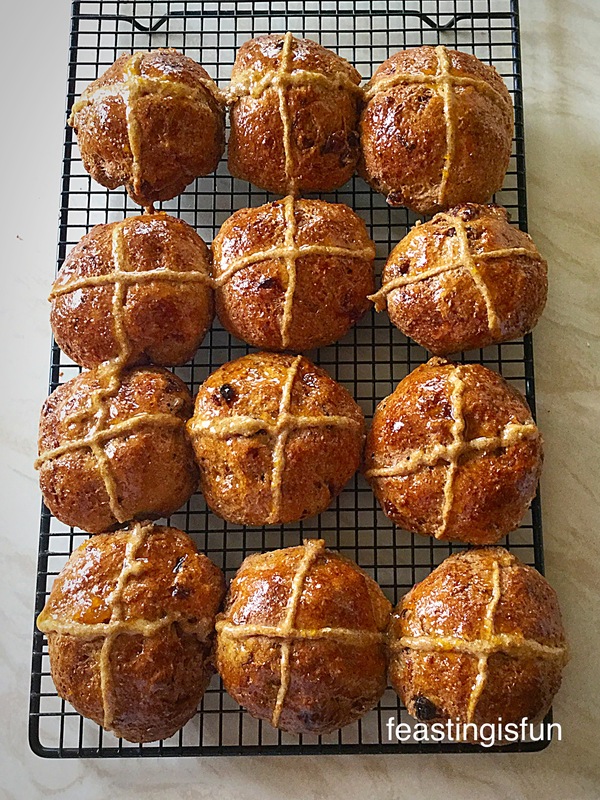 Since they shouldn’t have to miss out on all the Easter food fun I developed this recipe for 100% Wholemeal Hot Cross Buns. 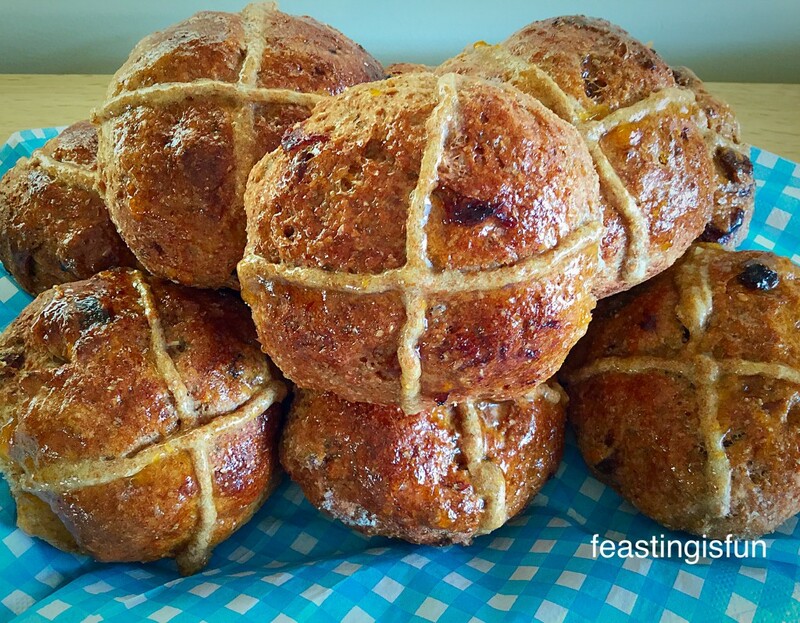 Wholemeal Hot Cross Buns perfect just as they are! 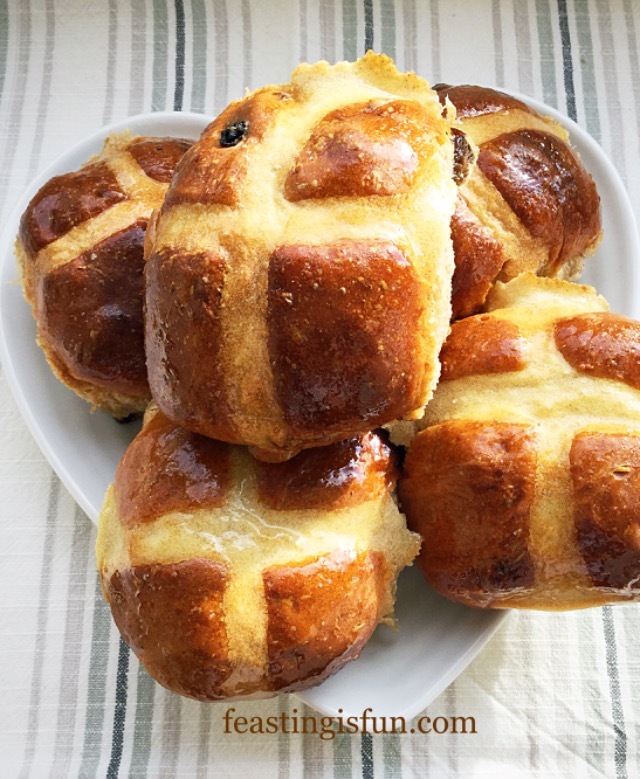 Everyone can enjoy these Wholemeal Hot Cross Buns, eaten just as they are or split and toasted with a light spread of butter. And the added beauty of these buns is the spicy, cinnamon aroma, filling the house as they bake and then again when they are toasted. Also these buns are packed full of fibre. So they are tasty and good for you! Also, while toasting a hot cross bun, there was a knock on the front door. Our postman had a parcel to deliver. And as I stood there signing for the parcel, he revealed that the smell of a toasted bun was his favourite smell in the world. Wholemeal Hot Cross Buns a healthy breakfast or snack. 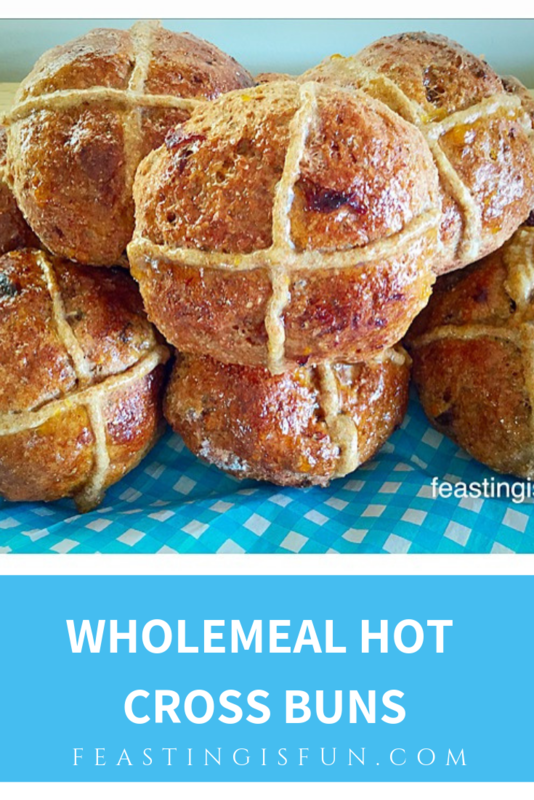 Making Wholemeal Hot Cross Buns is as straightforward as for the regular ones. While switching the flour from strong white bread flour, to 100% wholemeal flour, not bread flour, I also upped the yeast content and with a few more tweaks, these gorgeous buns were made. 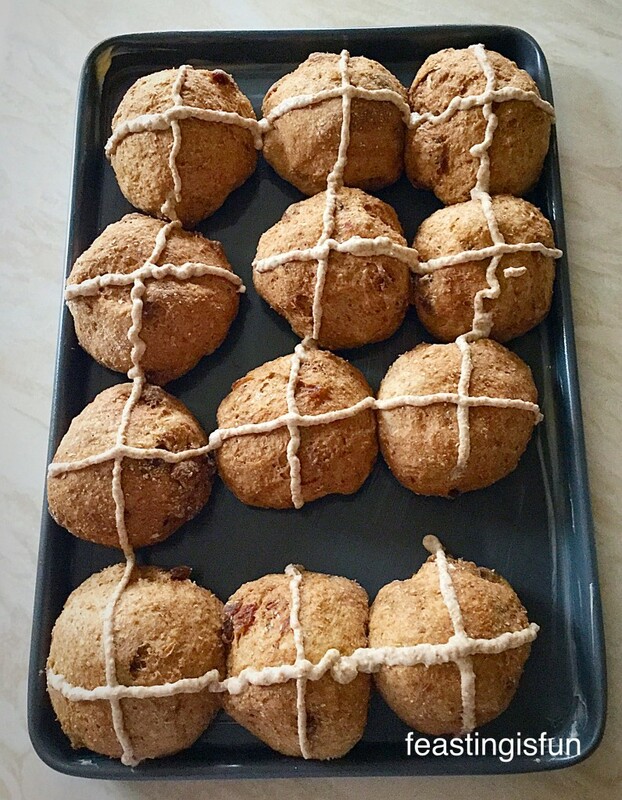 The cross on this Wholemeal Hot Cross Bun is there as a reminder. Why The Cross On Top Of The Bun? 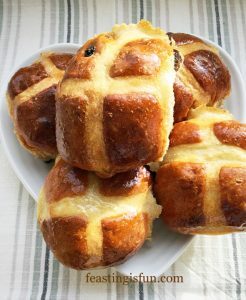 The cross on the bun, is there to symbolise and remind us of The Cross on which Jesus died, only to surprise a lot of people, when He was fully alive two days later. So it is good, that the small symbol of a cross on a bun, reminds us that Jesus came for a reason. To love the unloved, to heal the sick, to befriend those that society cast out. And remember, out of two of His followers, one was a tax collector and the other a prostitute! So amidst all the chocolate and bunnies, lovely though they are, take a moment to remember you are loved. One small verse packs quite a powerful punch. You and I are the who so ever. Know that you are loved. And whatever your circumstances, you are loved more than you could ever imagine. If you would like to know more, please read Important Stuff. 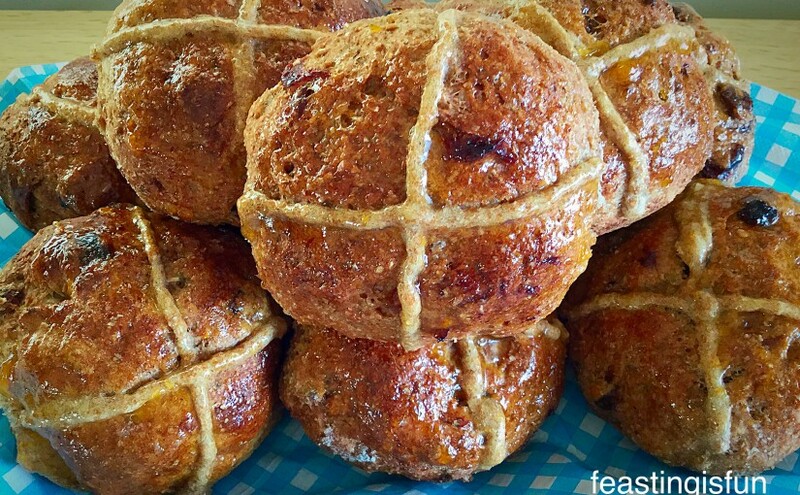 Now to show your body some love by making these Wholemeal Hot Cross Buns. 50g/2oz Unsalted Butter at room temp. – plus extra for greasing the baking tray. 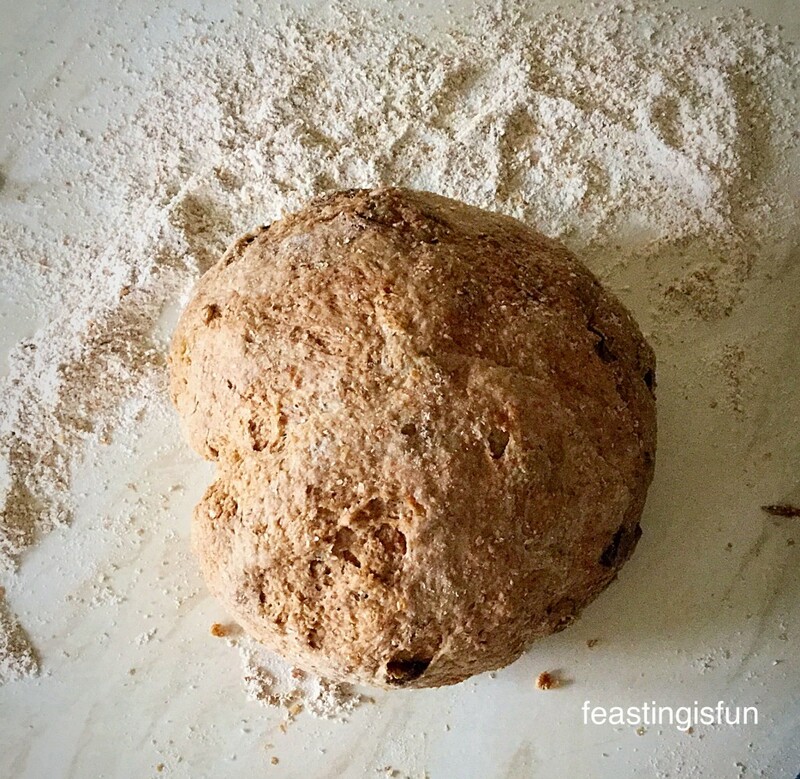 Method: This method is for use with a bread maker or stand mixer. 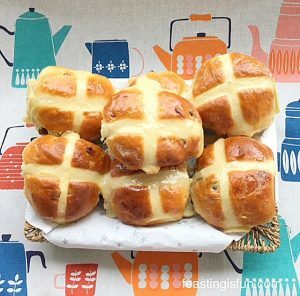 Alternatively you can make these Wholemeal Hot Cross Buns by hand. First of all, add both the milk and water to the bowl. As soon as the bread maker has completed the dough cycle, ensure the dough has doubled in size, if not wait until it has. Then re start the dough cycle for 2 minutes, this will ‘knock back’ the dough for you. After the 5 minutes mixing is complete, stop the mixer. Scrape all the dough back into the bowl, it will be very sticky – don’t worry. Cover with a damp cloth and leave in a draught free place until doubled in size – 1 – 1 1/2 hours. As soon as the dough has doubled in size it can be tipped out and shaped. Grease a large baking tray (40cm x 28cm x 2.5 cm) with butter. Shape the dough into a ball and weigh. Divide the weight by 12 and this will give you the weight of dough needed for each individual bun. 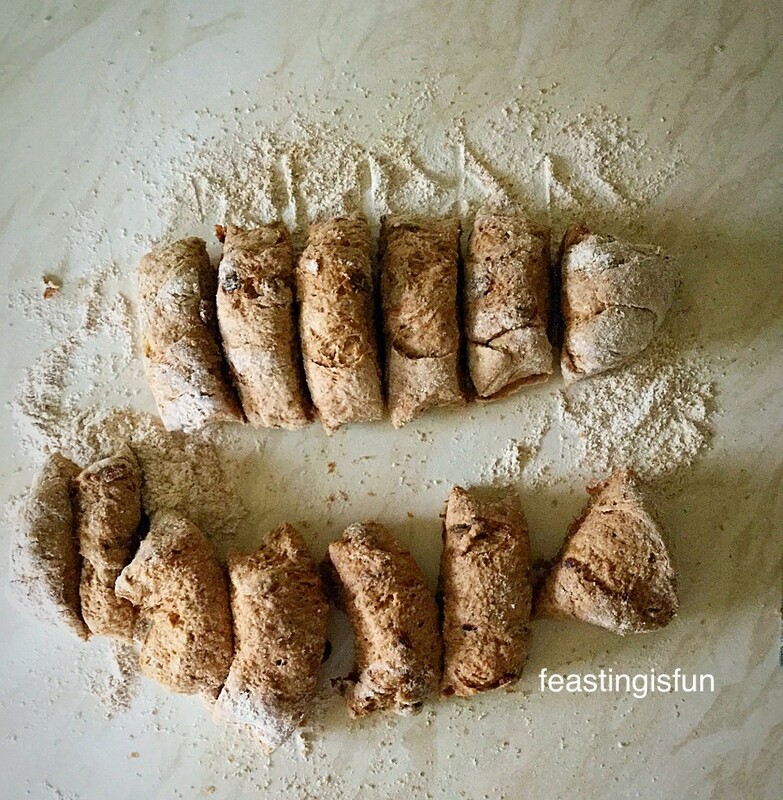 Alternatively, cut the dough in half and then cut each half into 6 even portions. Lightly form the dough into a ball. Cut the dough in half using a large knife or metal dough scraper. Roll each portion into a ball. Tucking the seam at the bottom. 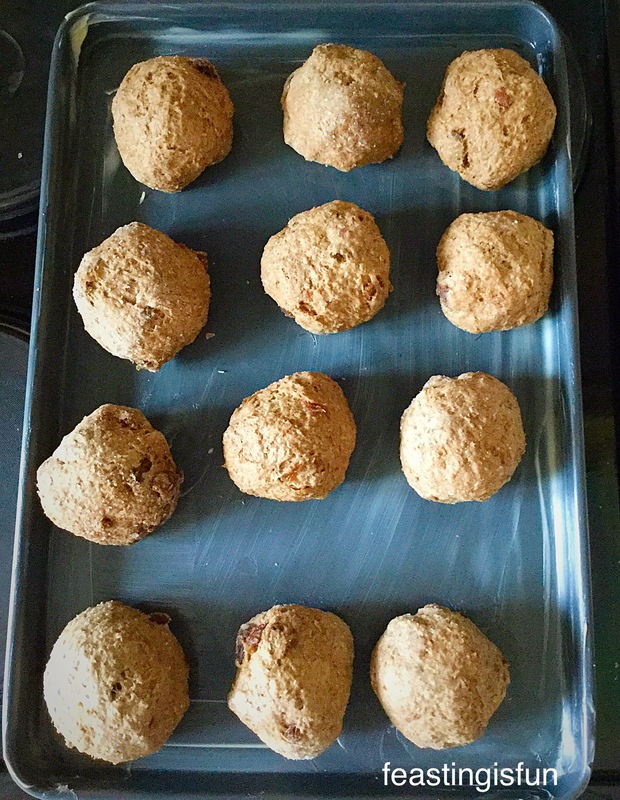 Place each dough ball on the baking tray, spacing evenly apart. Cover with a damp cloth and place in a draught free place until doubled in size – approx. 1 hour. While the buns are proving make the paste for the crosses. Mix the flour and water together in a small bowl and then spoon into a small piping bag or plastic sandwich bag. As soon as the buns have doubled in size, snip the end off of the piping bag (corner of a sandwich bag) to leave a small hole. 10 minutes before the buns are ready to bake preheat the oven to 220C/200C fan gas mark 7, 425F. Pipe crosses on to the buns. Place the buns into the middle of the oven and bake for 20 minutes. 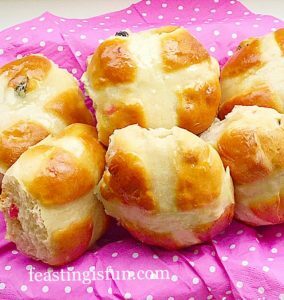 The Wholemeal Hot Cross Buns are baked when they are a deep golden brown and sound hollow when rapped on the base with your knuckle. 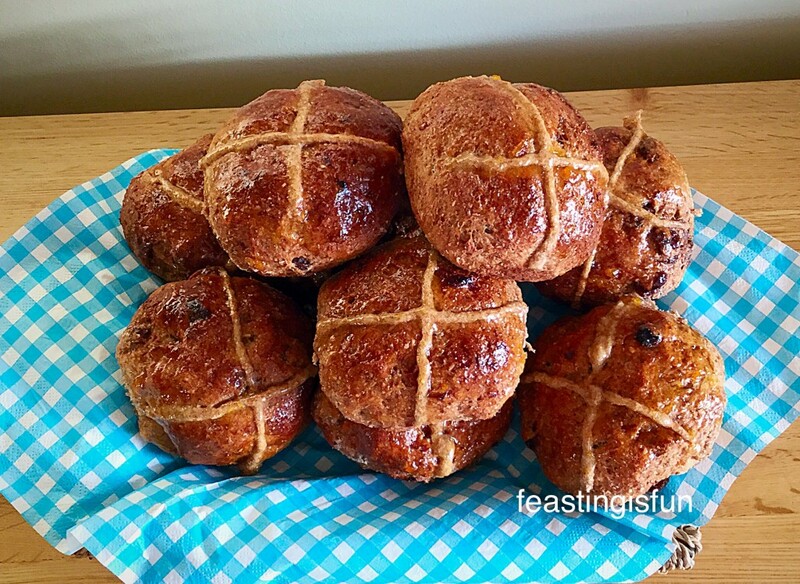 Once baked remove the Wholemeal Hot Cross Buns from the oven and transfer to a cooling rack. As soon as the buns are baked remove from the oven and transfer to a cooling rack. Place the apricot jam into a heatproof bowl and microwave for 20-30 seconds to melt. Brush the warm buns with apricot jam using a pastry brush. Wholemeal Hot Cross Buns ready to be shared with loved ones! 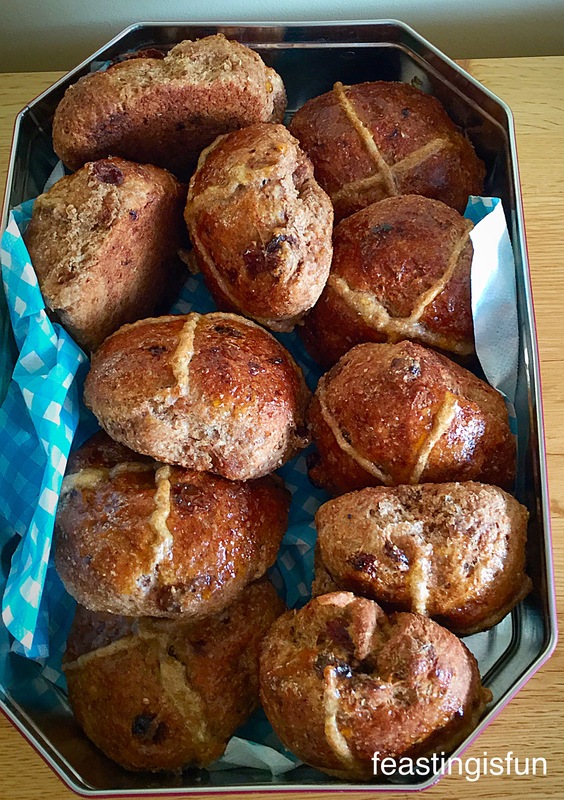 Wholemeal Hot Cross Buns packaged into a tin, ready to be given away. Eat toasted with butter or just as they are. Store in an airtight tin for up to 3 days. Freeze in an airtight container for up to one month. 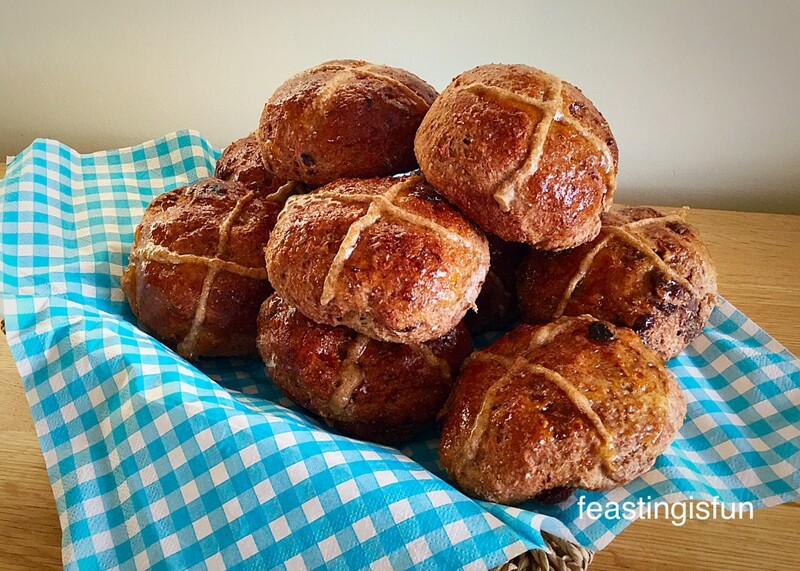 If you have the capacity, why not bake a double batch of these delicious Wholemeal Hot Cross Buns and give some away? Easter is a time when our family comes together and celebrates the resurrection of Jesus Christ our Saviour. And sitting together, around the table, giving thanks before a meal is important. Giving thanks for the food we share and the provisions we have however is not only for Easter. Rather, it is an important daily practise in our lives. So is sharing the love that Jesus shows us. Whether it be through words, or more practically. And that is why I am so passionate about sharing food outside of our normal circle on this blog.